Perhaps youve enjoyed one or more relaxing vacations in the Hawaiian Islands  sunning on beautiful beaches, snorkeling, golfing, or visiting popular island sites. For your next visit, however, you may want to add a little spice to the normal fare. How would you like to circle in a helicopter around steam vents where Hawaiis lava flows into the Pacific, or sail in twenty-knot winds below Kauais mighty Na Pali cliffs, or catamaran sail from Maui to snorkel with Lanais giant sea turtles? We recently returned from a Hawaiian Islands sojourn where we thrilled to the above experiences and other adventurous day tours. Alternating our beach-lounging days with these tours created our most unforgettable Hawaiian holiday. Here are seven exciting tours on the islands of Hawaii, Kauai, and Maui that capitalize on the islands' unique volcanic topography and tropical coastline. Choose from these and scores of other available tours to add spice to your own Hawaiian holiday. The Big Island of Hawaii owes its array of starkly contrasting terrain to its continuing volcanic activity. The dry western shore, or Kona Coast, consists primarily of black lava flows jutting into the Pacific Ocean. Sandy beaches intermittently punctuate this desolatingly beautiful stretch of coast. One of the best ways to experience the coastline is to take the Fair Winds Snorkel and Dive tour. The 60-foot catamaran motors from Keauhou Bay, just south of the main town of Kailua-Kona, to the beautifully isolated Kealakekua Bay Marine Preserve, the Big Islands most prolific reef. Youll snorkel or dive here for 1-1/2 hours in crystalline waters, discovering white-mouthed moray eels, parrot fish, schools of jacks, and multiple varieties of colorful tangs and butterflyfish. The shoreline reef drops steeply to over 100 feet in depth, providing excellent explorations for the scuba divers among the tours clientele. An unforgettable experience on the Big Island is Blue Hawaiian Helicopters tour, the Big Island Spectacular. 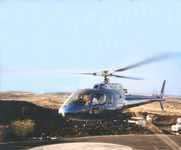 Taking off from the conveniently located Kona coast heliport, your knowledgeable pilot steers the comfortable ASTAR helicopter eastward over the saddle between towering Mauna Kea and Mauna Loa peaks. Youll then veer south to view the active Kilauea volcanic area. The activity varies almost daily here. (On our voyage, we saw glowing earth heated by lava flowing in underground tubes). 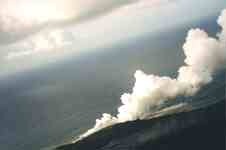 A major highlight is viewing the showy clouds of steam where the hot lava flows into the Pacific. After refueling in Hilo on the east coast, the tour continues northward along the Hamakua coast, exploring inland to view spectacular waterfalls cascading into enormous amphitheater valleys. The jungle vegetation on this windward side of the island contrasts sharply with the islands dry, exposed lava fields. View from a kayak on the flume A truly unique tour experience is freshwater "fluming" with Kohala Mountain Kayaks. This adventure takes advantage of a sugar cane irrigation flume, constructed in 1902 in the north shores Kohala mountains. 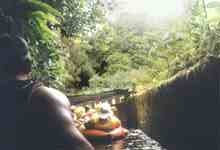 Your guided tour vans leave from Kapaau, driving with kayaks in tow to a launch on the seven-foot wide flume. Five-person kayaks float in a consistent flow through three miles of interesting jungle scenes, hillside vistas, and long tunnels (headlamps are supplied). Occasionally youll encounter a refreshing douse, passing under small rivulets rushing into the flume. On debarking, take the opportunity for a final kayak team water fight before returning via van. Kauais Na Pali coastline is one of the worlds most awe-inspiring spots. Helicopter footage for films such as Jurassic Park have highlighted its rugged beauty. 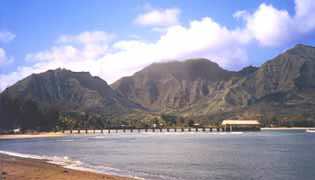 Stretching for over 20 miles eastward from beautiful Hanalei Bay on Kauais northern coast, the 3,000-foot cliffs are virtually inaccessible for the majority of their expanse. Captain Sundowns sailing adventure provides one of the most rewarding and adventurous ways to explore the coast. The nimble catamaran sails past green and brown colored cliffs and chasms, waterfalls, ancient lava flows, and sea caves highlighted by churning surf. The captain is experienced at finding a suitable sheltered cove for snorkeling in the aqua blue waters at the far point of the sail. After a tasty lunch, the catamaran returns back to Hanalei. 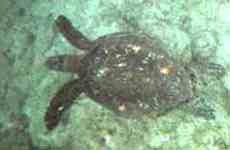 (On our voyage we were fortunate to snorkel among deep reef channels with sea turtles and schools of jacks. 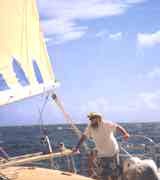 On the upwind return sail, we donned our wet suits to better enjoy rollicking whitecap spray from forward seats on the windward hull. En route, the captain and his mate landed a couple of good-sized sea trout, adding to the excitement). 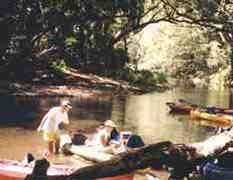 A self-guided kayak tour up the Wailua River provides another memorable day of Kauai exploration. Kauai Paradise Kayaking supplies a double kayak and all required gear. Starting at the river mouth, youll paddle two miles upriver, as far as you can navigate. Beaching your craft, youll follow a jungle trail leading 1-1/2 miles further upstream to a beautiful water fall. After a cooling swim and lunch, hike back, then paddle the Wailuas South Branch to visit its beautiful fern grotto. Returning to the river mouth, youll feel pleasantly tired, yet exhilarated, having experienced some of Kauais most beautiful and serene tropical waterways and jungle settings. The old whaling village of Lahaina, with preserved buildings amid upscale shops and restaurants, is the perfect starting point for one of the Mauis most exciting exploration opportunities. Trilogys Lanai Snorkel and Dinner Cruise sails west to the island of Lanai, offering picturesque island vistas en route. On Lanais east shore the catamaran anchors in an isolated cove where youre likely to find giant sea turtles. After some Lanai beach lounging, you have the option to take a van tour to view the highlights of this uniquely Hawaiian island. With a population of less than 3,000, Lanai is still in the process of making the transition from its days as Hawaiis chief pineapple-growing island. The tour passes through arid terrain before reaching a temperate-climate forested upland and the islands only town. After a tasty beach dinner, youll be treated to a sunset sail back to Maui, topping off the incredible day. One of the Hawaiian Islands most renown snorkeling and diving spots is Molikini Crater. Sitting approximately 10 miles south of Maui, Molikini consists of a 1/2-mile-long semi-circular volcanic rim sheltering an underwater crater containing numerous species of sea life. 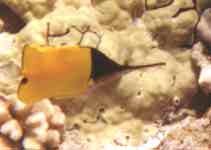 The Pride of Maui Molikini Crater Snorkel Cruise makes two half-day trips to the crater. Youll be able to snorkel continuously for two hours to view the impressive, never-ending arry of inhabitants, including moray eels, trumpetfish, tangs, butterflyfish, snappers, puffers, triggerfish, parrotfish, wrasse, and Moorish Idols. (On our trip we found that Molikini Crater lived up to its advance billing, even rewarding us with a display of dolphin antics as we neared the crater). Due to Molikinis popularity, its a good idea to take an early morning departure for maximum enjoyment. Click here for details to plan your own adventure trip to Hawaiis Isles.